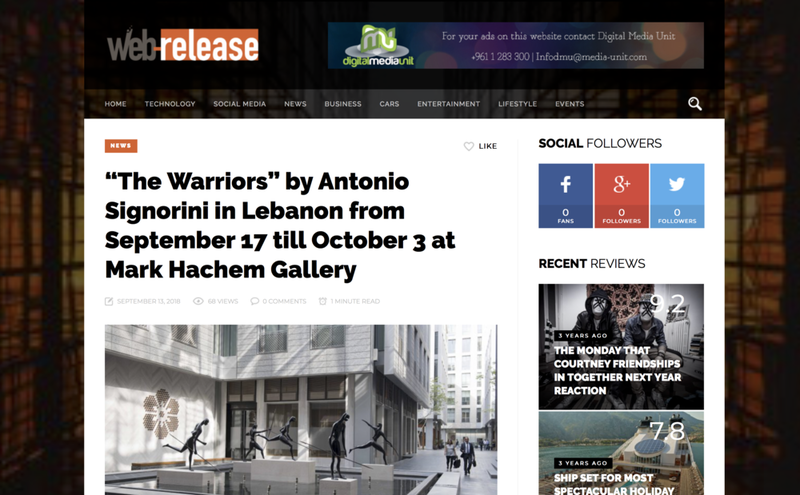 “THE WARRIORS” by Antonio Signorini will visit Lebanon from September 17 till October 3, 2018, participating in Beirut Art Fair and Beirut Art Week from September 18 till September 25, continuing afterwards till October 3 at Mark Hachem Gallery, Beirut. Signorini is an Italian artist who became further acquainted with findings in the Mesopotamian region and this inspired him to create The Warriors, one of his most compelling collections, that was exhibited during this year in July and August at Fondaco Marcello art space in Venice. His collection the WARRIORS is composed of 7 singular pieces in a special bronze alloy on a Iranian marble pedestal. They will all be strategically placed before and during the Art Fairs in Beirut and Istanbul. His monumental piece called DNA will also be placed in the fair showing the breath of work of the artist.